Content not direct related to FB, but interesting reading. For a closer look at the project goals and strategies, please read the “Introduction to Firebird Butler”. FbNetExternalEngine is plugin for Firebird 3+ that allows you to write stored procedures, functions (not yet) and triggers (not yet) in any .NET language. There’s no limitation on what you can or cannot do in the code. Full power of .NET and .NET eco-system is available for you. Migration Guide to FB 3 – Cyber Monday promotion! 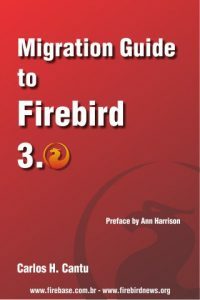 From today up to 26-November, the Migration Guide to Firebird 3 eBook (PDF version) is being sold for USD 12 instead of USD 16. The promotion is valid only for payments done using Paypal. If you haven’t moved to Firebird 3 yet, this is a great chance to buy the Migration Guide for a lower price, and save you some hours of headache. Click here for more information and to buy it online. RAD Studio 10.3 (Rio) was released today, and includes updated FireDac components with official support to Firebird 3. Check all the new features here.